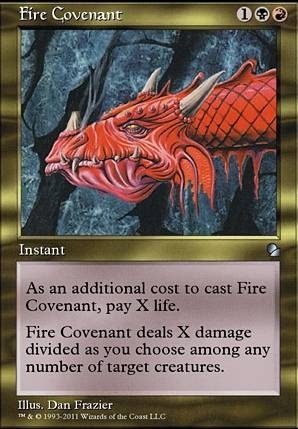 As an additional cost to play Fire Covenant, pay X life. Fire Covenant is a must. 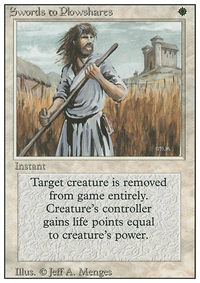 @newrise : Re: "Grier Reach Sanitarium" - I think it's actually more nuanced than that and different versions of the card actually spell the name differently. But, I think you're right I need to change it. Thanks! @maff98 : Re: Gitrog. Well, that's why cards like Damnation , Toxic Deluge , and Fire Covenant are good. And sometimes you get them with a turn-1 EE for 1. 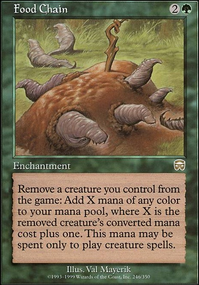 Typically I like to give Xantcha to the Gitrog player, in the hope that they decide to attack one person for 11. So in that sense, you don't strictly have to stop Gitrog to get on the with the Plan of Xantcha. 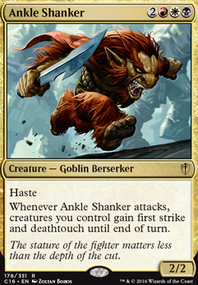 But, actually killing Gitrog is typically one of the best ways to slow down that deck (apart from Leyline of the Void ), so if it is a major presence in your meta then adding a terminate or something seems ok. Although, I don't like it a whole lot cause they usually get to ramp enough that replaying Gitrog isn't hard. A whole-board wipe is usually a lot more effective. Also Blood Moon is extremely effective against Gitrog. But, yeah, that deck is very good and there's like 5 or 6 cards we have that are effective, so you have to tutor for one of them early. Smelt seems weak. I think i'd prefer Rakdos Charm ? I'm not sure. Hey, consider Tithe , Knight of the White Orchid and Mistveil Plains ? Tithe and Mistveil are excellent with Sunforger and Knight is nice to put a Shock land or Mistveil onto the battlefield. Tithe especially when playing five colors because it can potentially tutor for two Shock lands or one Shock land and Mistveil. 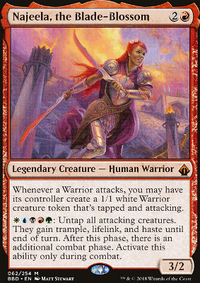 Consider Mardu as base colors instead of Boros? Because of the expensive deck budget I think playing only Boros is hindering your deck more than helping it; after all you can play all colors because of Najeela. Mardu gives you more black for some nice Warrior interactions ( Mindblade Render , Blood-Chin Rager ), combat interactions ( Tymna the Weaver , Azra Oddsmaker ), tutors ( Demonic Tutor , Diabolic Intent ), tokens ( Bitterblossom ) and to strengthen the Sunforger package ( Anguished Unmaking , Fire Covenant ).